Pastures with properly mineralized soils, high organic matter, and biological activity produce higher quality plants or feed, and result in better animal performance and fewer herd health problems. Farms with healthy soils growing more nutritious, higher quality pasture can produce higher milk yields while feeding fewer concentrates. Managing internal parasites, which can be a challenge with young stock on organic dairy farms, is reported by some farmers to be easier after improving soil health. Some farmers also report experiencing fewer metabolic and other herd health problems, longer-lived animals, and more replacements reaching productive years. An important part of organic dairy farming is creating a farm where microorganisms in both the soil and the livestock’s digestive system are abundant and healthy. These organisms play essential roles in the process of cycling nutrients and energy from soil, air, and sun to plant, animal, manure, and back to the soil. Note these pasture-specific soil fertility issues. A good grazing system will provide an even distribution of manure in pastures. Application of compost instead of raw manure to pastures can help eliminate rejected forage in the next grazing cycle. Fall application generally results in less rejected forage. Healthy soil biology incorporates manure into pasture and meadow soils as rapidly as possible to minimize nutrient loss. Monitor the rate at which earthworms, dung beetles, or other beneficial soil life incorporate manure into the soil. The basis of good grazing management is taking the time pasture plants need to rest after each grazing in order to photosynthesize and replenish the energy stored in the base of the plant and in roots. Continuously grazing animals in the same pasture, or returning them to a pasture before it is fully regrown, does not give plants time to recover and results in overgrazing damage. The resulting weak plants may stop growing or die. These weakened overgrazed plants will not compete well with weed species, will not hold soil well, and result in bare soil and erosion. Some grasses and clovers will survive by staying very short, never growing tall enough for livestock to graze easily, while livestock will reject other areas that will soon grow up into weeds, brush, or small trees. When animals go into a pasture, they are doing more than just eating. They trample weeds and dead plants into the soil, which adds organic matter. They select plants they want to eat and spread manure. Well-managed perennial pastures (see Figure 1) provide livestock with a mixture of many types of plants, providing a variety of nutrients and medicinal compounds. Having a diversity of plants will provide cows with many options to choose from so they can balance their own ration. Plant diversity assures that some plants grow even when weather conditions are extreme. Different plants grow differently throughout the growing season. Figure 1. 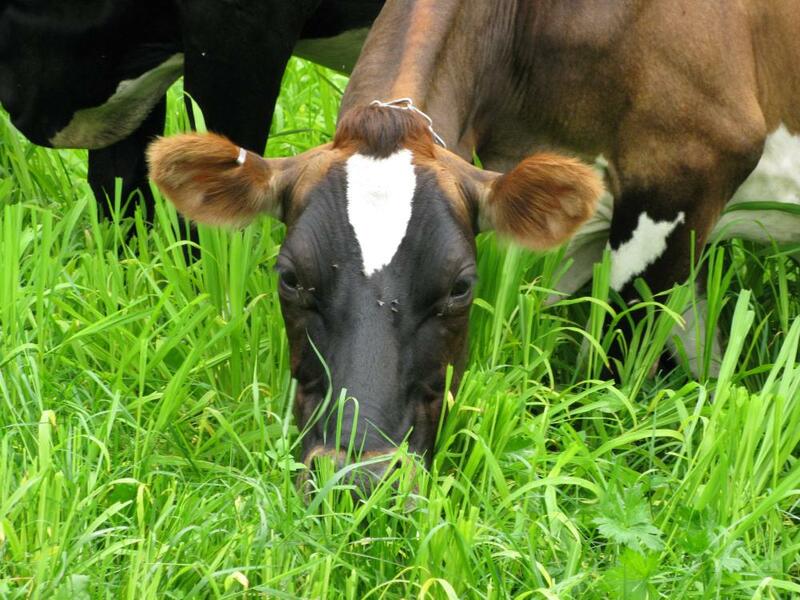 High quality pasture contains a mix of grasses and legumes. Photo Credit: Sarah Flack, Sarah Flack Consulting. The group of plants known as the cool season grasses have their highest growth rates during the cool part of the growing season. Some common cool season perennial grasses suitable for grazing include orchardgrass, Kentucky bluegrass, and perennial ryegrass. Another group of grasses that may be grazed is the warm season grasses. These grow fastest during the warmer part of the season. Sorghum-sudangrass is one of the more commonly grazed warm season grasses. Perennial legumes also show seasonal variations in growth and include white and red clover as well as alfalfa and birdsfoot trefoil. Many dairy farms have land used for both grazing and haying, depending on the time of year. Many of the cool season perennial grasses do well under either good grazing management or hay management. Areas grazed more often tend to have plants better adapted for grazing, such as white clover, Kentucky bluegrass, perennial rye grass, and some fescues. Areas primarily harvested mechanically tend to have species less adapted for grazing such as alfalfa, red clover, timothy, and brome grass. When selecting varieties of plants to grow in pastures, it is important to choose varieties that are suited to the soil conditions, palatable, and locally adapted. Reed canary grass, for example, is well adapted to wet soils. It can, however, be less palatable than other species of grasses in a pasture setting. Tall fescue grows well in areas with hot dry summers, and can be used for fall/winter stockpiled grazing. However, tall fescue is highly unpalatable when compared to other cool season perennial grasses, so it should be planted only if the local climate makes it necessary. Depending on soil types and the crops grown on the farm, pastures may be entirely permanent perennial fields or they may rotate with some annual crops. Farmers who have access to equipment, labor, and suitable land can rotate grain or corn silage with a pasture grass/legume sod. Farms in areas with extended summer dry periods may grow summer annual crops, such as sorghum-sudangrass or millet for grazing (see Figure 2). Some farms may benefit from grazing brassica crops or other alternative annual pasture mixes. Figure 2. Grazing Japanese millet. Photo credit: Debra Heleba, University of Vermont Extension. Note that there are some risks associated with grazing some annual crops. For example, when grazing sorghum-sudangrass, caution should be used to prevent prussic acid poisoning. To prevent problems, avoid grazing sorghum-sudan during or right after a frost, and be sure plant height is at least 24 inches before grazing. Since most dairy farmers use these crops as midsummer drought pasture, they easily avoid these issues. Other farmers choose different annual crops. For example, pearl millet, which can be grazed at 14 to 24 inches of height, does not cause prussic acid poisoning. Forage brassicas, such as turnips, rapeseed, and kale, are high yielding and can be grazed, although there are still a relatively small number of dairy farms in the Northeast doing this. These plants maintain quality well into freezing temperatures and can be used to extend the grazing season on some farms. Health problems can occur if brassica grazing is not done correctly however. These can include bloat, atypical pneumonia, nitrate poisoning, and hypothyroidism. To avoid health disorders, the following two management practices should be followed. First, introduce brassica pastures slowly (over 3 or 4 days) and avoid sudden changes from regular pasture to lush brassica pastures. Second, brassica crops should not be the only pasture or forage in the ration. Supplement with dry hay, silage, or “regular” pasture while grazing brassicas. Each farm needs to assess the feasibility of growing annual crops according the farm family’s goals and the economics of production. 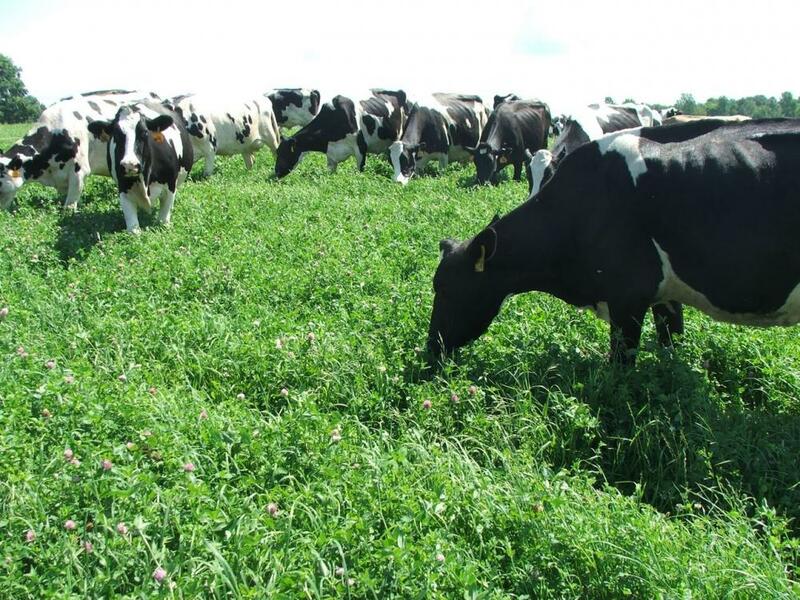 A permanent, well-managed grass legume pasture provides significant benefits in building and maintaining soil fertility, and with a good grazing management system there should be few reasons to plow and reseed permanent pastures. How grazing management is done will shift the plant species in the pasture. Under good grazing management, plants grazed will thrive, while poor quality pasture plants will die out. White clover will naturally spread by its stolons (stems that travel on the soil surface), grasses will spread by tillering (side shoots), while woody weed species that do not like to be grazed frequently will grow less vigorously and die out. "Mob stocking" is a term from New Zealand that describes a system where large groups of cattle or sheep are used to rapidly defoliate pastures or brushy areas repeatedly to kill weed species and encourage pasture plant growth. This method requires a high stocking density and is best done with a group of animals that does not have high-quality feed needs. Robinson, J. Eatwild.oom [Online]. Jo Robinson, Vashon, WA. Available at: www.eatwild.com (verified 5 Sept 2012).